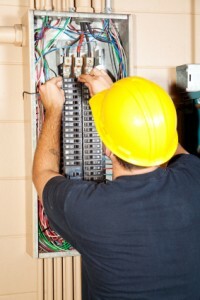 San Dimas Electrician » Why Are Your Circuit Breakers Tripping? Why Are Your Circuit Breakers Tripping? When a circuit breaker in your San Dimas home trips, you’ll need to go out to your panel in your garage, your basement, or the back yard to switch it back on again and get power flowing back to that part of your home. This can be extremely frustrating, especially when it’s happening over and over again. And if this is happening over and over, you should actually think twice before you switch the breaker back on. To understand what kind of danger tripping breakers can mean if they’re becoming a recurring problem, it’s important to understand why circuit breakers trip. The professionals at San Dimas Electric have compiled a few reasons that circuit breakers trip, and described how you should react to them. Circuit breakers trip in order to cut off the flow of electricity when the circuit can’t handle the load. This prevents circuits from overheating and potentially causing a significant amount of damage. if circuits breakers didn’t trip, house fires would be a much more common and significant problem. Before you go back out to switch a breaker back on again one more time, you’ll want to consider why the breaker is tripping, or you could end up allowing your electrical system to do a significant amount of damage to your San Dimas home. Here’s a quick look at what those terms mean to you, what they mean for your home, and how you can prevent further damage. Circuit overloads are the number one reason that circuit breakers trip. An overloaded circuit is simply a circuit that’s being asked to provide more electricity to your San Dimas home than it has the capacity to provide, which in turn causes the circuit to overheat. If you’re a running a computer and a television through the same circuit, using 20 amps of electricity in a circuit that was meant to run 15 amps, the circuit breakers will trip to prevent the circuit possibly overheating and catching fire. If you have an overloaded circuit in your home, you should try to redistribute your electrical devices so that there aren’t too many on one circuit. You may also want to keep some electrical devices turned off and unplugged to reduce the amount of electricity you’re asking of your circuits. Short circuits are another common cause of tripping breakers, and they can be more dangerous than circuit overloads. A short circuit occurs when a “hot” wire comes into contact with a “neutral wire” in one of your outlets. When this happens, a large amount of the current flows, which creates more heat than the circuit can handle. Again, the circuit breaker trips to prevent any dangerous outcomes. You’ll be able to recognize a short circuit by the burning smell that it leaves behind, and you may also notice a brown or black discoloration in the area. Short circuits may be caused by wiring problems in your San Dimas home, so if you have short circuit, you’ll want to call an electrician for a safety inspection. Short circuits and ground fault surges are very similar. A ground fault occurs when a hot wire touches a ground wire, or when the side of a metal outlet box touches a ground wire. Just like a short circuit, you’ll be able to see a discoloration around the area where a ground fault surge has occurred. All of these problems can cause huge amounts of damage to your San Dimas home if they aren’t dealt with properly. If your breakers continue to trip frequently, call our professionals as soon as possible to have your electrical system inspected or for electrical repairs. 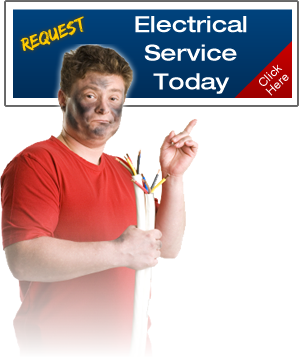 If you’re looking for an electrician in San Dimas, call San Dimas Electric at 909-592-2191, or fill out our online request form. If you are looking for a San Dimas electrical contractor, please call (909) 592-2191 or complete our online request form.